At the risk of dating myself, did your bedroom wall have velvet posters that glowed by black light when you were a kid? Mine too! Under normal light, a fluorescent flocked poster was nothing spectacular. But once you turned on a black light – WOW! Vivid neon colors popped off the poster, and anything white took on an ethereal glow. 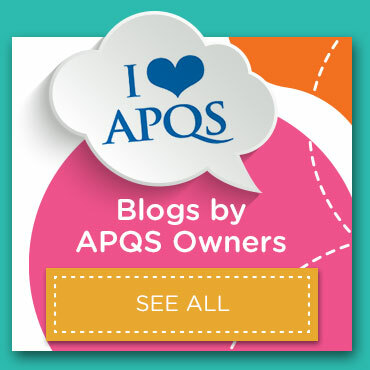 You can take advantage of that same “black light magic” on your APQS quilting machine! 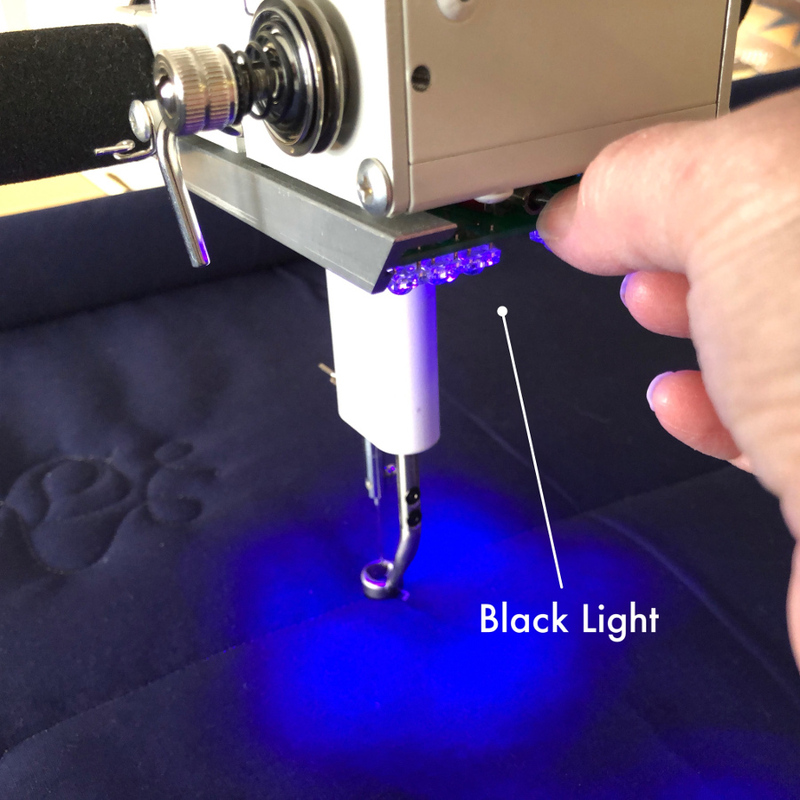 Why have black light on your longarm? 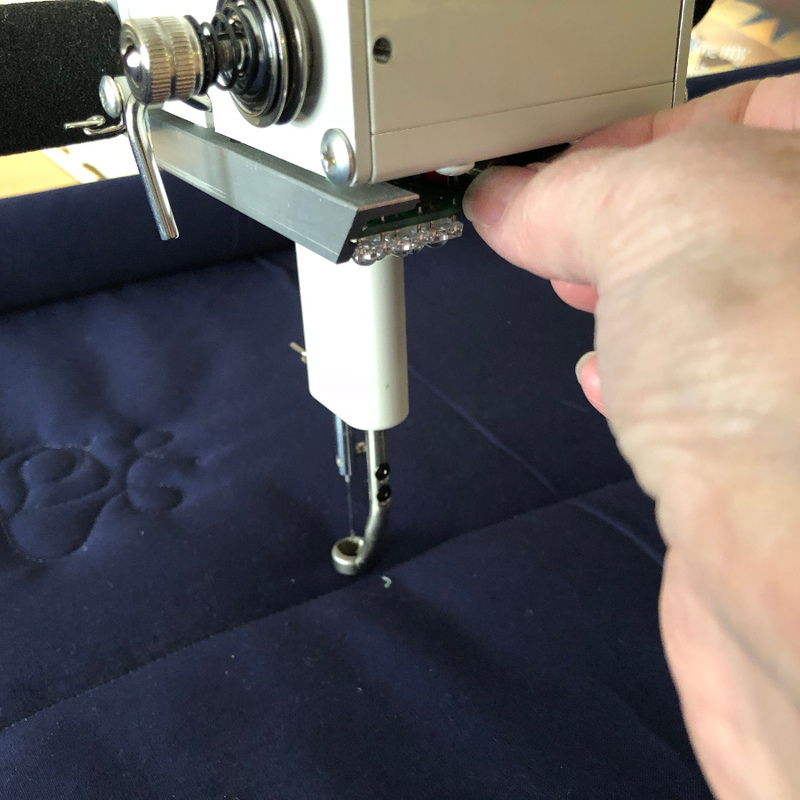 Try quilting with white thread on white fabric without losing your place, and you’ll quickly find out how valuable it is! 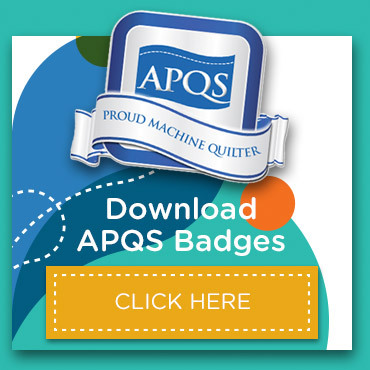 New APQS machines come standard with bright LED light, plus a built-in LED black light for ultimate versatility. 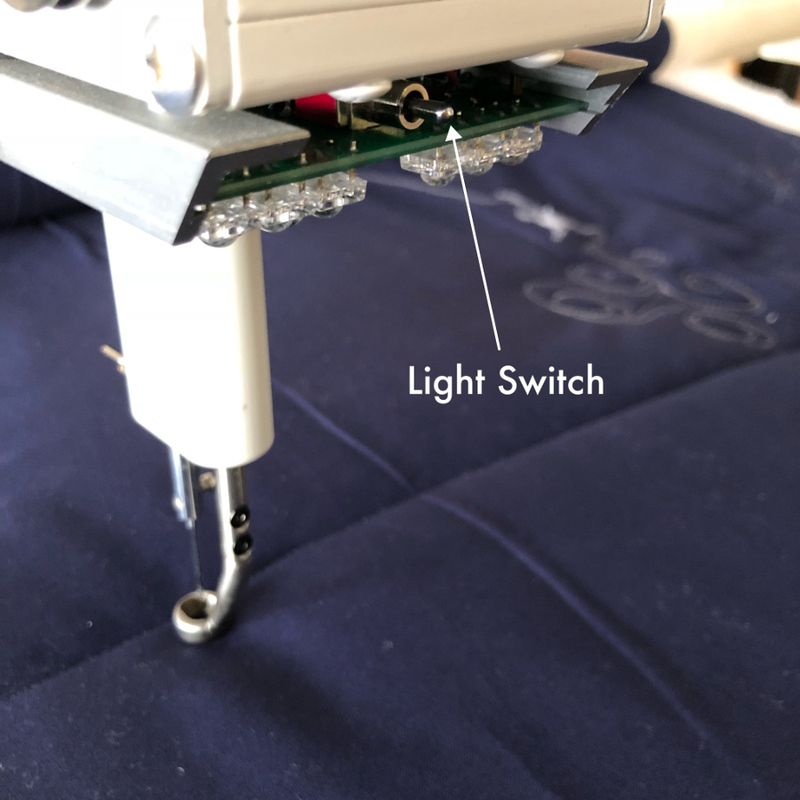 Quickly toggle between the two light modes using the easy-access switch on the machine’s throat, or turn the light off completely to create shadows that help when stitching on very dark fabrics. 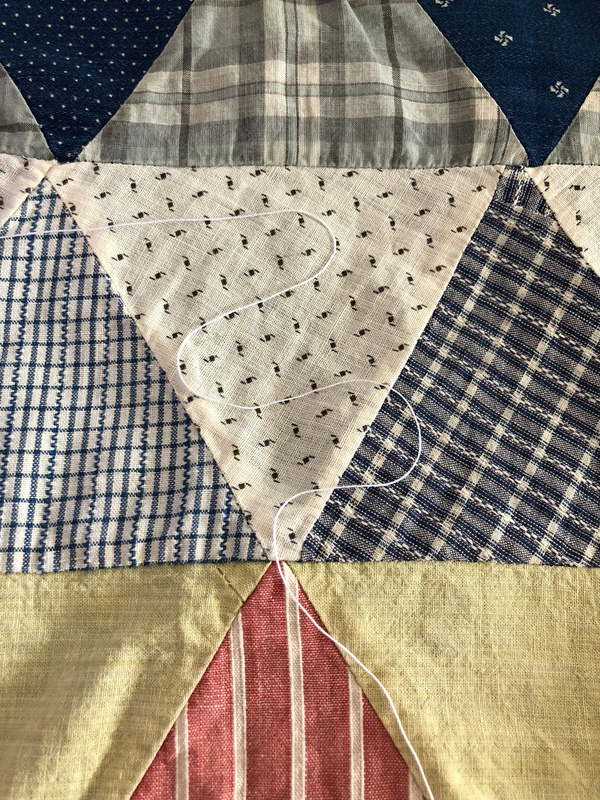 Look at the white thread splashed across the white fabric triangle below. You can see it in the navy fabric, but it gets lost across the white. Now flip on the black light and—presto! There it is! No more squinting or accidentally running over your previous stitches because the thread jumps out and grabs you! 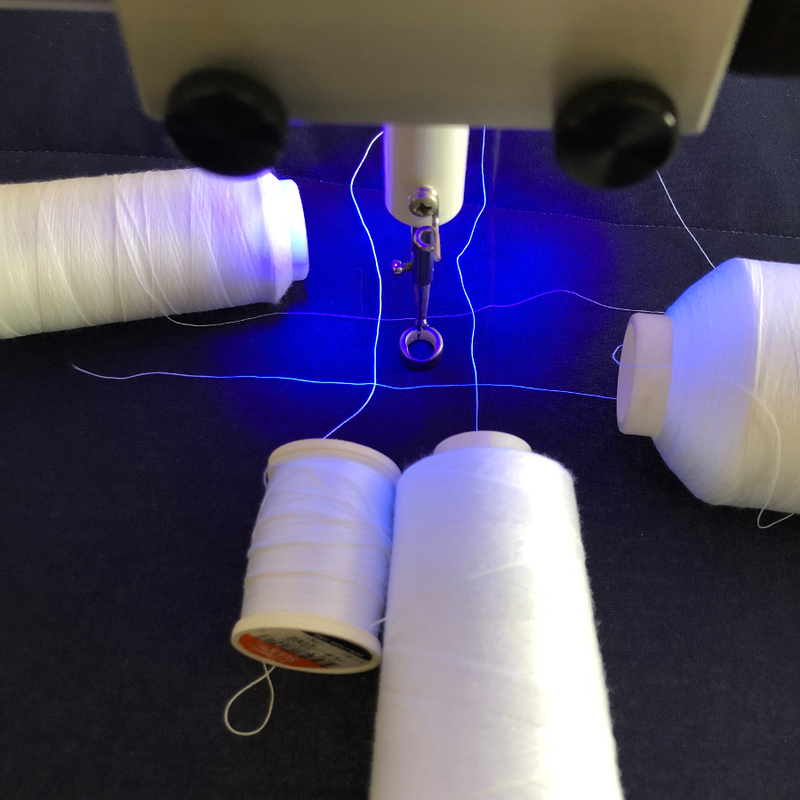 While most white threads will have some glow, thread composition may affect how well your thread shows up under black light. It’s sometimes difficult for a camera to capture what your eye actually sees, but take a look at the four different threads shown in the photo below. Three threads have a distinct glow, but the thread strand crossing behind the machine’s hopping foot glows very little. 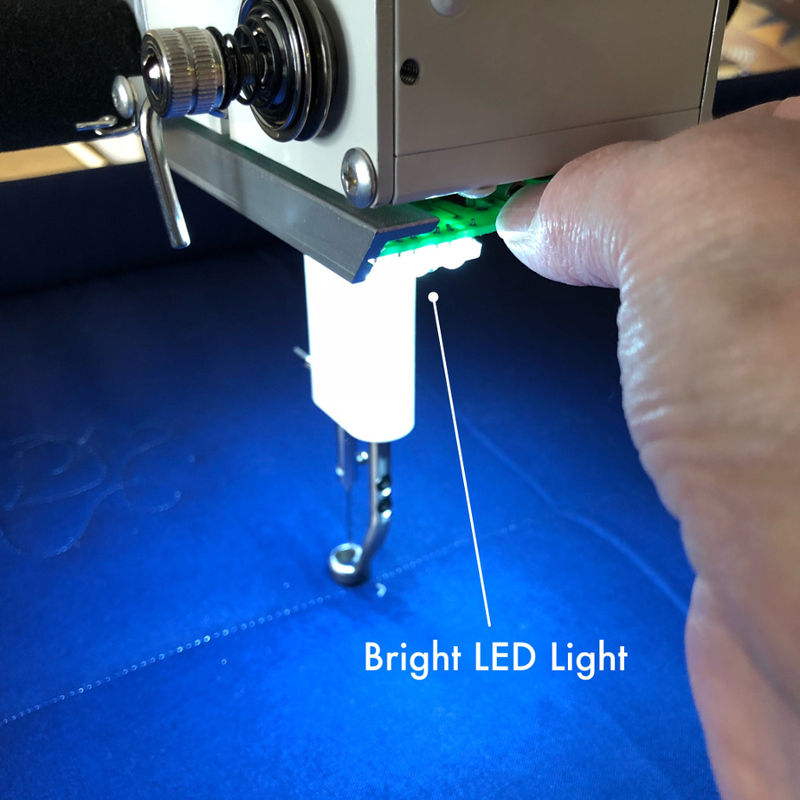 In this case, if you have difficulty seeing the thread, try turning off the LED light completely to create shadows that will help you see where you’re going. 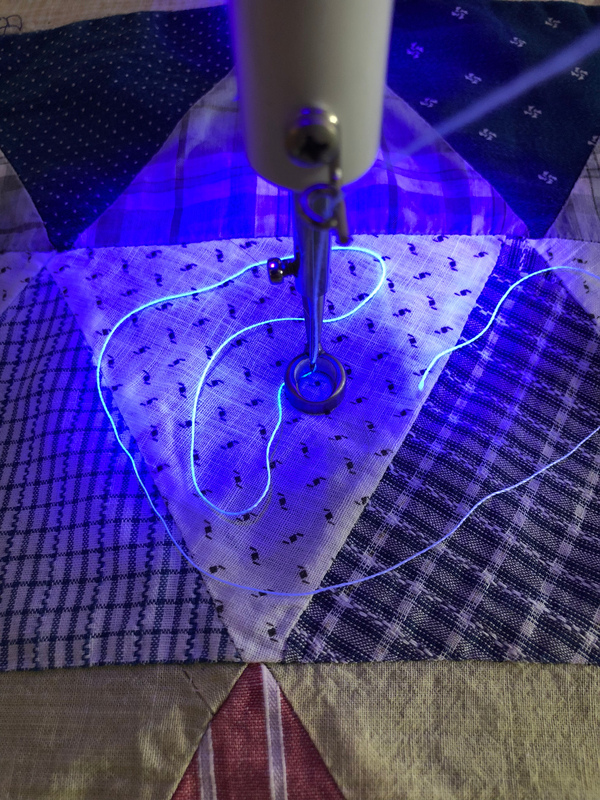 Many other fluorescent threads will also glow brightly under black light, posing creative opportunities for thread artists who love explosive color. Quilts stitched with these threads will be very vibrant even without seeing them under black light. But if you shine a black light on them—POW! 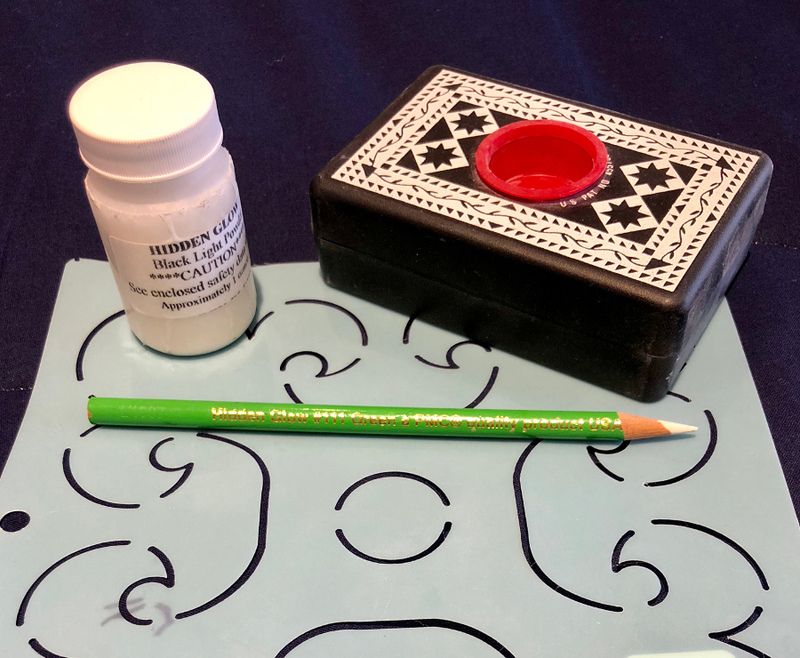 Marking aids such as glow pencils and glow powder let you mark designs on light fabrics where traditional marking methods may not show. Fill a pounce pad with glow powder and swipe it across a stencil, turn on your black light, (maybe switch on some 70’s disco music?) 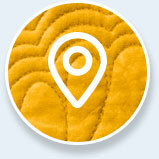 and have fun quilting! 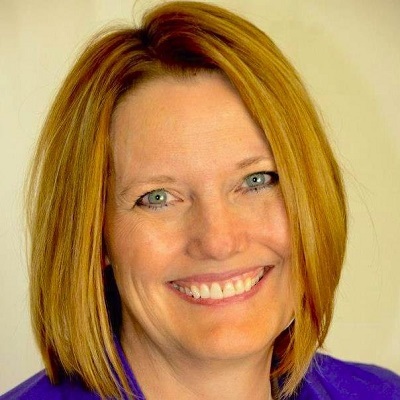 In this video, Angela Huffman, APQS Dealer and Educator, gives you a close-up tour of Millie and all its features. 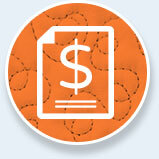 Sometimes it can be difficult to find the continuous path of certain pieced border designs. Here is a great way to tackle a flying geese border. Every now and then, we quilters have to pick up a needle and thread. How do you avoid sore fingers after a bout of hand sewing? 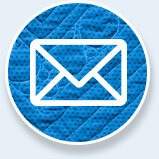 Read some of our quilters' home remedies, and you might find a method that work for you!